Here is the latest news from League One and League Two (22nd February 2019). “I think Lawrence will just wait until the end of the season. Ultimately that will be up to him and his agent,” he said. Blackpool manager Terry McPhillips says strength in depth and competition for places is the reason behind Elias Sorensen’s lack of game time. “There was no issue,” McPhillips told the Blackpool Gazette. “If we get a couple of players back, I’ll have the same problem this weekend, so I don’t know who will miss out, but someone will have to. 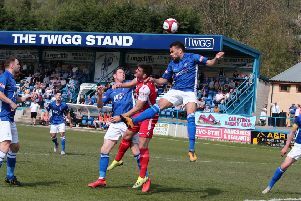 Young has been instrumental in Farnborough’s current 10-game unbeaten run and scouts from Football League clubs have been making regular checks. He’ll will remain at Gresty Road until summer 2021 under his new deal, having originally joined on a one-year contract in summer 2017.